Definition at line 111 of file lltransfermanager.h. Definition at line 150 of file lltransfermanager.h. Definition at line 56 of file lltransfermanager.cpp. References i, LLTTT_NUM_TYPES, mTransferBitsIn, mTransferBitsOut, and S32. Definition at line 68 of file lltransfermanager.cpp. References cleanup(), llendl, llwarns, and mValid. Definition at line 142 of file lltransfermanager.h. Definition at line 143 of file lltransfermanager.h. Definition at line 94 of file lltransfermanager.cpp. References FALSE, mTransferConnections, and mValid. 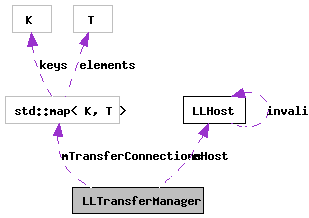 Referenced by cleanup_app(), end_messaging_system(), and ~LLTransferManager(). Definition at line 117 of file lltransfermanager.cpp. Definition at line 175 of file lltransfermanager.cpp. Referenced by reliablePacketCallback(), and LLTransferSourceAsset::responderCallback(). Definition at line 148 of file lltransfermanager.cpp. References LLTransferConnection::getSourceChannel(), getTransferConnection(), and NULL. Referenced by processTransferAbort(), and processTransferRequest(). Definition at line 160 of file lltransfermanager.cpp. References LLTransferConnection::getTargetChannel(), getTransferConnection(), and NULL. Referenced by LLAssetStorage::getEstateAsset(), LLAssetStorage::getInvItemAsset(), processTransferAbort(), processTransferInfo(), and processTransferPacket(). Definition at line 138 of file lltransfermanager.h. Definition at line 139 of file lltransfermanager.h. Definition at line 134 of file lltransfermanager.cpp. Referenced by getSourceChannel(), and getTargetChannel(). Definition at line 78 of file lltransfermanager.cpp. References gMessageSystem, llendl, llerrs, mValid, NULL, processTransferAbort(), processTransferInfo(), processTransferPacket(), processTransferRequest(), LLMessageSystem::setHandlerFunc(), and TRUE. Definition at line 129 of file lltransfermanager.h. Definition at line 565 of file lltransfermanager.cpp. References LLTransferSource::abortTransfer(), LLTransferTarget::abortTransfer(), LLTransferSourceChannel::deleteTransfer(), LLTransferTargetChannel::deleteTransfer(), LLTransferSourceChannel::findTransferSource(), LLTransferTargetChannel::findTransferTarget(), LLMessageSystem::getS32(), LLMessageSystem::getSender(), getSourceChannel(), getTargetChannel(), LLMessageSystem::getUUID(), gTransferManager, llendl, llwarns, and S32. Definition at line 273 of file lltransfermanager.cpp. References LLTransferTarget::abortTransfer(), LLTransferTarget::completionCallback(), LLTransferTarget::dataCallback(), LLTransferTargetChannel::deleteTransfer(), LLTransferTargetChannel::findTransferTarget(), LLMessageSystem::getBinaryData(), LLTransferTarget::getNextPacketID(), LLMessageSystem::getS32(), LLMessageSystem::getSender(), LLMessageSystem::getSize(), getTargetChannel(), LLMessageSystem::getUUID(), gTransferManager, llendl, llinfos, LLTS_DONE, LLTS_OK, llwarns, MAX_PACKET_DATA_SIZE, MAX_PARAMS_SIZE, LLTransferTarget::mDelayedPacketMap, NULL, S32, LLTransferTarget::setGotInfo(), LLTransferTarget::setLastPacketID(), LLTransferTarget::setSize(), size, TRUE, and LLTransferTarget::unpackParams(). Definition at line 411 of file lltransfermanager.cpp. References LLTransferTarget::abortTransfer(), LLTransferTarget::addDelayedPacket(), addTransferBitsIn(), LLTransferTarget::completionCallback(), LLTransferTarget::dataCallback(), LLTransferTargetChannel::deleteTransfer(), FALSE, LLTransferTargetChannel::findTransferTarget(), LLMessageSystem::getBinaryData(), LLTransferTarget::getNextPacketID(), LLMessageSystem::getReceiveCompressedSize(), LLMessageSystem::getReceiveSize(), LLMessageSystem::getS32(), LLMessageSystem::getSender(), LLMessageSystem::getSize(), getTargetChannel(), LLMessageSystem::getUUID(), LLTransferTarget::gotInfo(), gTransferManager, llendl, LLTS_DONE, LLTS_OK, llwarns, MAX_PACKET_DATA_SIZE, LLTransferTargetChannel::mChannelType, LLTransferTarget::mDelayedPacketMap, NULL, S32, LLTransferTarget::setLastPacketID(), size, and TRUE. Definition at line 204 of file lltransfermanager.cpp. References LLTransferSourceChannel::addTransferSource(), LLTransferSource::createSource(), LLTransferSourceChannel::findTransferSource(), LLMessageSystem::getBinaryData(), LLMessageSystem::getF32(), LLMessageSystem::getS32(), LLMessageSystem::getSender(), LLMessageSystem::getSize(), getSourceChannel(), LLMessageSystem::getUUID(), gTransferManager, LLTransferSource::initTransfer(), llendl, llwarns, MAX_PARAMS_SIZE, S32, size, and LLTransferSource::unpackParams(). Definition at line 607 of file lltransfermanager.cpp. References LLTransferSource::abortTransfer(), LLTransferSourceChannel::deleteTransfer(), findTransferSource(), gTransferManager, llendl, llwarns, and LLTransferSource::mChannelp. Definition at line 140 of file lltransfermanager.h. Definition at line 141 of file lltransfermanager.h. Definition at line 107 of file lltransfermanager.cpp. Definition at line 153 of file lltransfermanager.h. Definition at line 155 of file lltransfermanager.h. Referenced by addTransferBitsIn(), getTransferBitsIn(), LLTransferManager(), and resetTransferBitsIn(). Definition at line 156 of file lltransfermanager.h. Referenced by addTransferBitsOut(), getTransferBitsOut(), LLTransferManager(), and resetTransferBitsOut(). Definition at line 159 of file lltransfermanager.h. Referenced by cleanup(), cleanupConnection(), findTransferSource(), getTransferConnection(), and updateTransfers(). Definition at line 152 of file lltransfermanager.h. Referenced by cleanup(), init(), isValid(), and ~LLTransferManager().